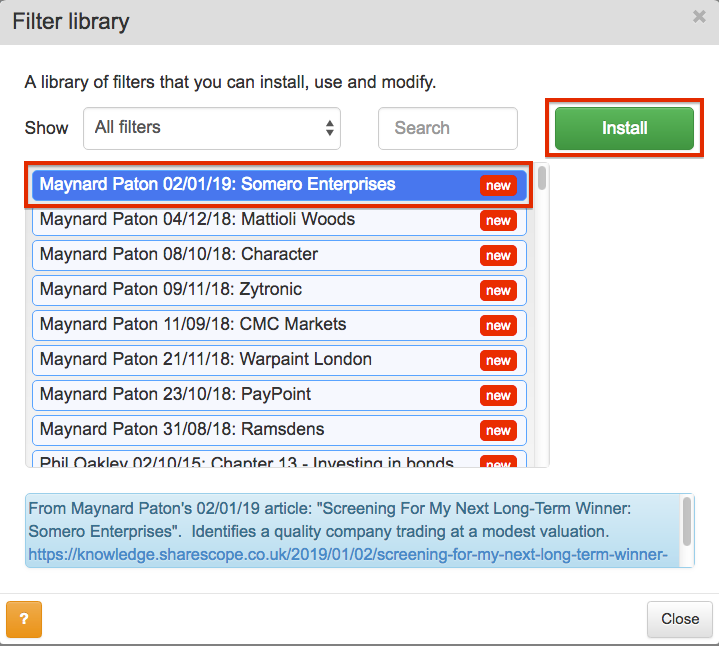 Before I start looking at Plus500 (LSE: PLUS), I have some good news…. 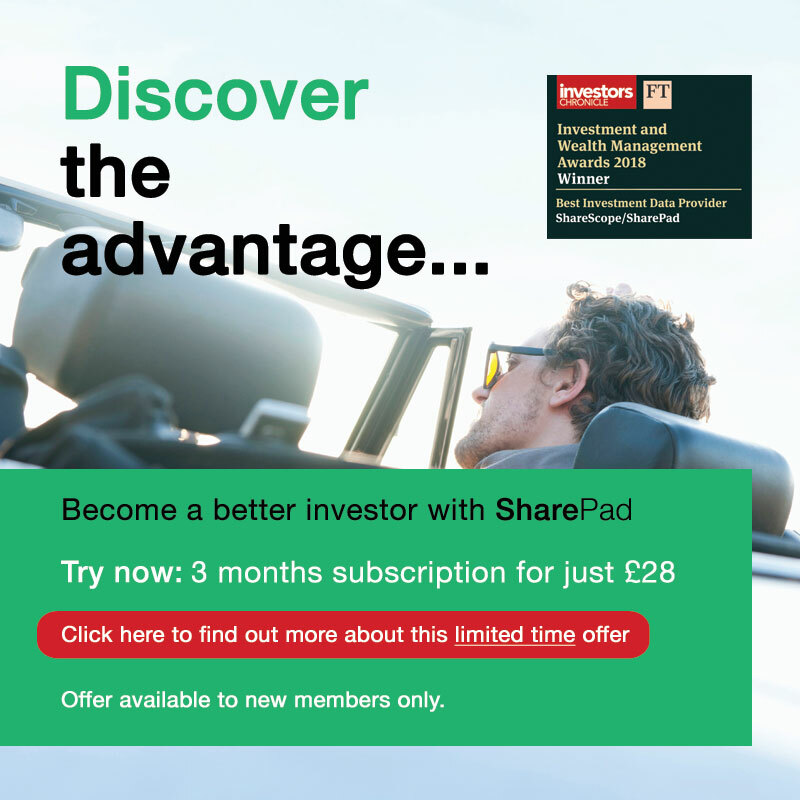 …you can now employ my SharePad screening criteria with just a few clicks! 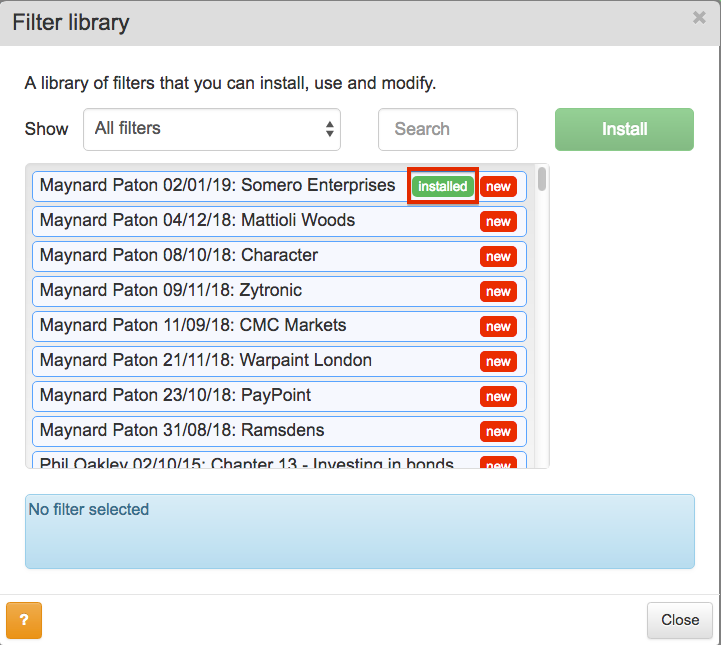 The process involves SharePad’s amazing Filter library. 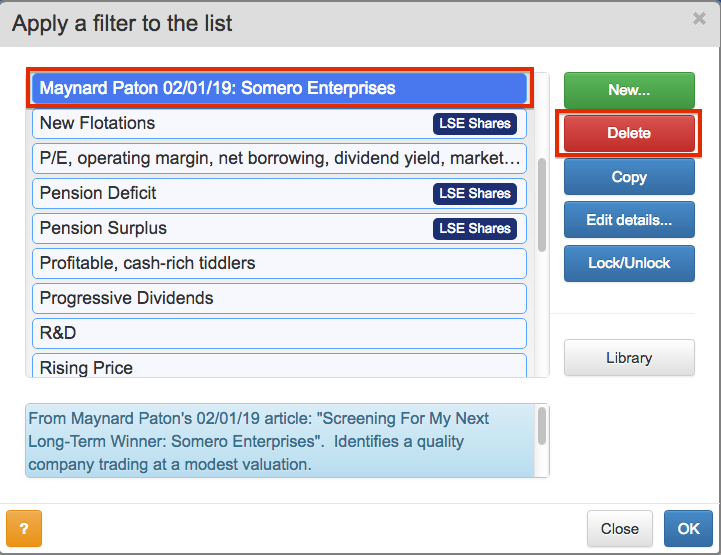 This facility gives you complete access to numerous pre-defined filters that have been used within various SharePad articles. I am staying with my Somero Enterprises screen for today’s company review. * A market cap of £150m or more. 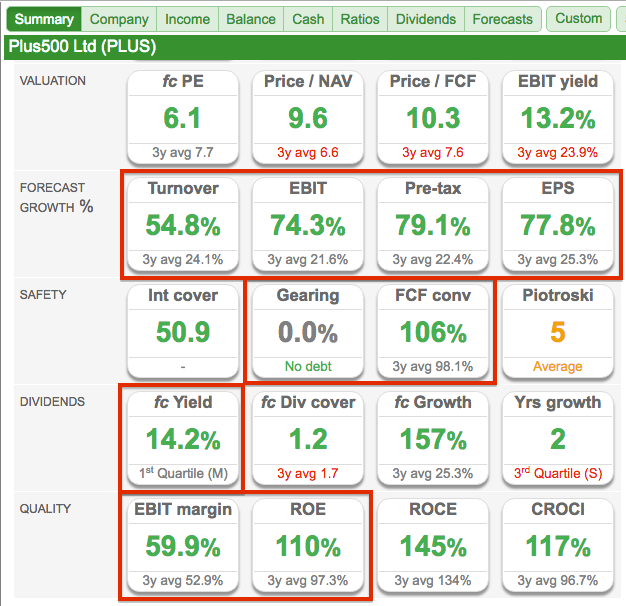 If Plus500’s recent progress has been better than expected, why then is the forecast P/E just 6.1? Pretty much a full house of impressive green numbers. 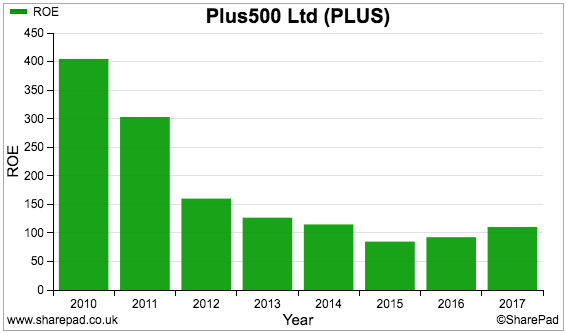 the first-class margin and return on equity (ROE) figures on the bottom row. Not only has the company performed better than expected of late, the accounting fundamentals suggest the business is extremely profitable as well. The trailing twelve-month dividend* is $2.19 per share — equivalent to approximately £1.75 — and supports a historic yield of roughly 12%. All great stuff. And yet that forecast P/E is 6.1. Let me now explain what Plus500 does. 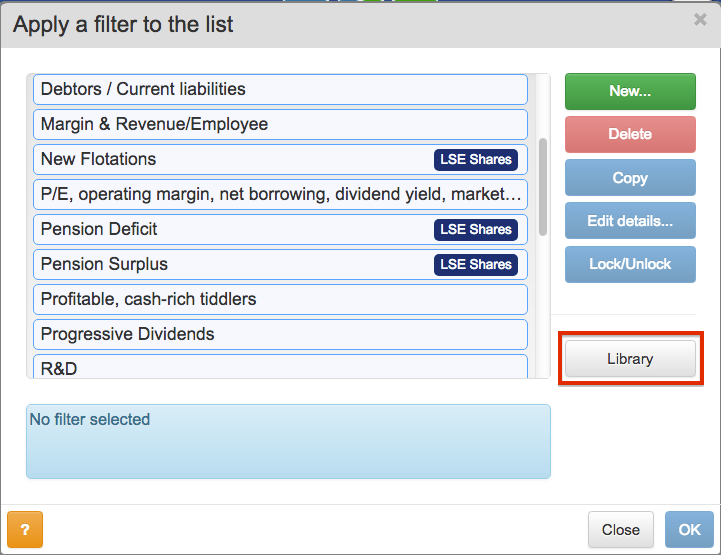 Plus500 claims to be the UK’s second-largest provider of contract-for-differences (CFDs). The business was established during 2008, was launched in the UK during 2010 and currently operates online in 50 other countries — notably Australia, Germany, Singapore, South Africa and Spain. 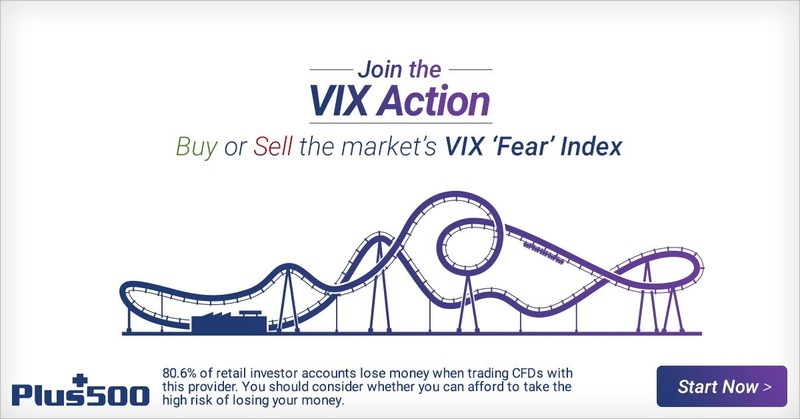 Customers can trade a wide variety of instruments — equities, indices, foreign exchange, commodities, exchange-traded funds and crypto-currencies. 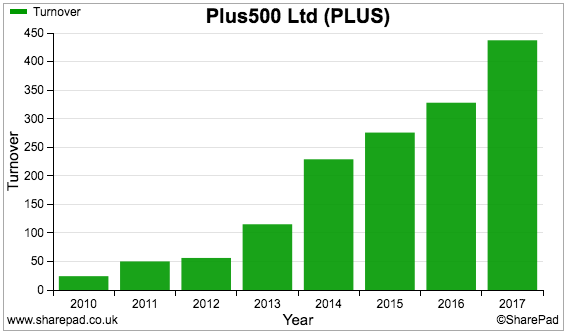 Active clients currently number 100,000 every quarter. 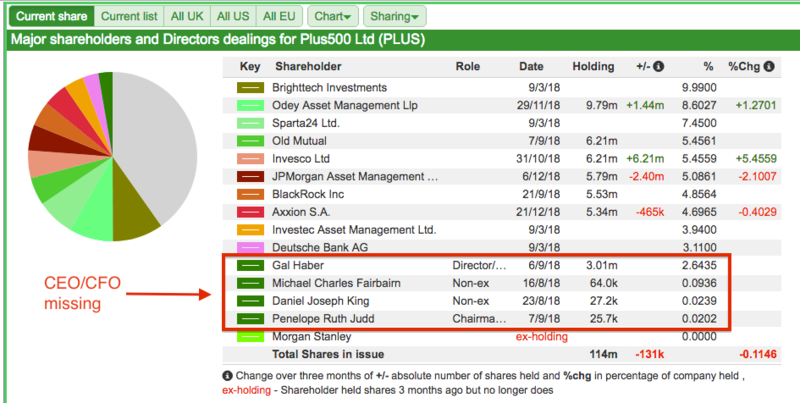 Plus500 earns approximately 90% of its revenue from dealing ‘spreads’ — the pricing difference between buying and selling a CFD instrument — with the rest coming from financing charges on certain positions held overnight. Notable competitors include IG Group and CMC Markets. 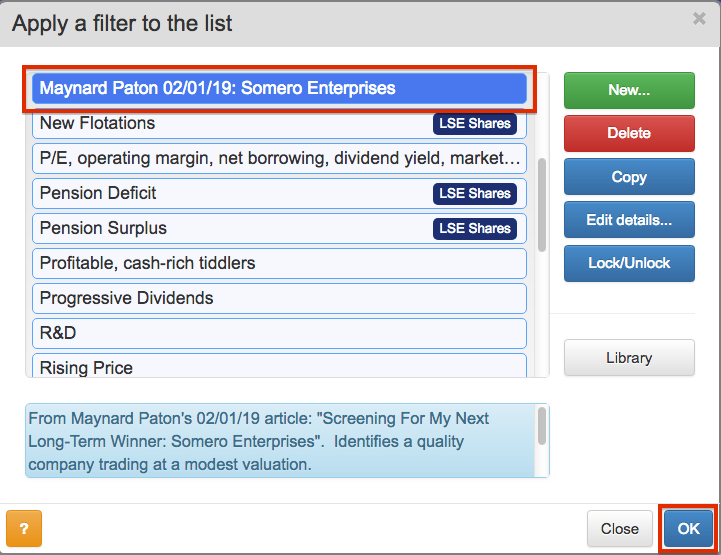 Plus500 differentiates itself by focusing on the small-time trader “without the distractions of having to attend to the different needs of higher net worth or institutional customers”. 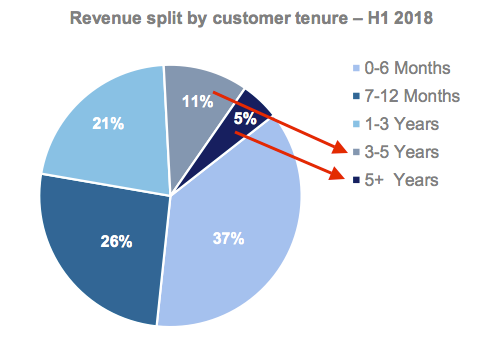 Plus500 claims 50% of its clients lose $650 or less. 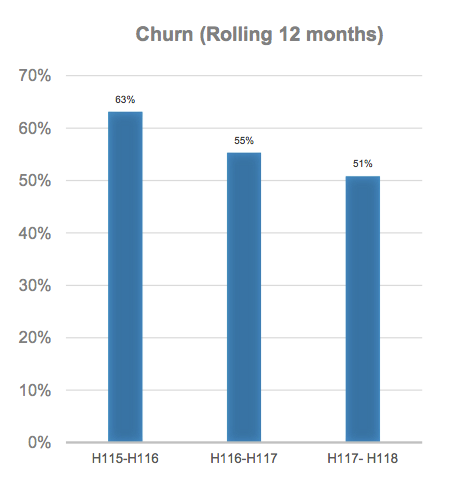 Those that win (approximately 20% of accounts) make an average of about $1,000. The low P/E may be partly explained by the overseas HQ. You see, a number of corporate-governance horror stories have emerged from foreign AIM shares over the years. The wider market therefore remains generally sceptical of any business listed in London but domiciled abroad. The fact that Plus500’s annual reports do not divulge as much information as those of standard UK companies may add to the scepticism. Nonetheless, the share price has done very well — albeit with some significant ups and downs. The 70% share-price collapse of 2015 is worth investigating. “Shareholders should note that Plus500’s UK subsidiary, Plus500UK Limited (“Plus500UK”), has in recent weeks been implementing certain enhanced client on boarding and Anti-Money Laundering (AML) processes which have resulted in additional documentation checks being required on existing and new Plus500UK customer accounts. Currently c.50% of Plus500’s revenue is derived from Plus500UK, and c.45% of Plus500UK’s customers have passed Plus500’s electronic verification process and are therefore allowed to trade. Those customers who are impacted are not able to open new positions until they are approved by the client on boarding team, however they are still able to freely close out open positions and to service these existing positions with additional Margin. The phrase “in close dialogue with the FCA” is not what you want to read. What happened was the FCA visited Plus500 a year before that announcement to inspect the company’s client-registration practices. …and forced Plus500 to own up during May 2015. Essentially Plus500 had overlooked the proper FCA procedures for registering new customers. Thousands of accounts were frozen, and resolving the problems took until early 2016 and cost Plus500 almost $5m. 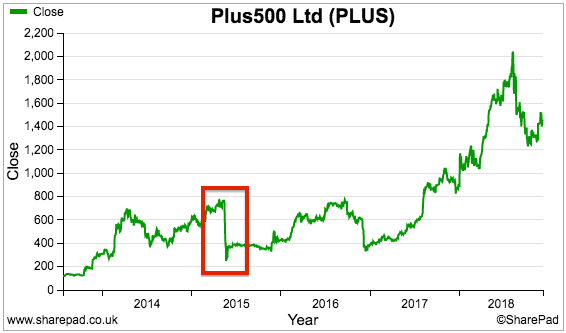 …and you might understand why investors have been reluctant to apply a rich P/E to this business. To perhaps allay the market’s suspicion of potentially ‘shady’ behaviour, Plus500 moved from AIM to the Main Market (and the FTSE 250) during 2018. Part IX of the associated Main Market prospectus was headed “Regulatory Overview”… and ran to 30 pages. One hopes such extensive documentation now means no more regulatory mishaps. Enthusiastic online marketing has underpinned Plus500’s progress. Emphasising the money to be made within the CFD industry, affiliates of Plus500 can earn up to $800 for every referral. …with an explosion witnessed during late 2017. The reason? The Bitcoin boom. However, the collapse of crypto-currencies during 2018 has meant the associated revenue surge was short lived. 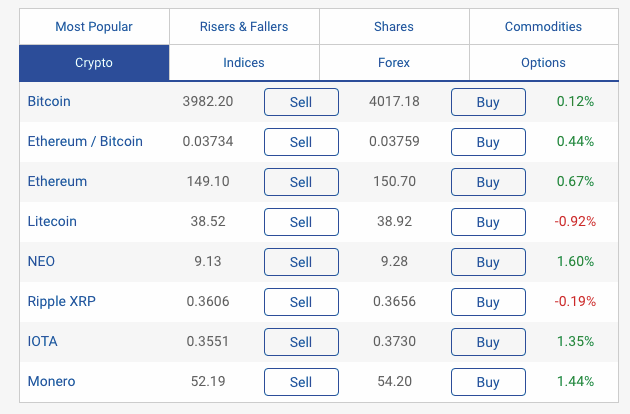 Those impressive growth rates within the earlier SharePad summary (second row) were therefore supported mostly by clients trading Bitcoin — activity for which has since reduced significantly. Are the 2019 forecasts too optimistic? In fact, I wonder whether those 2019 forecasts are too optimistic. 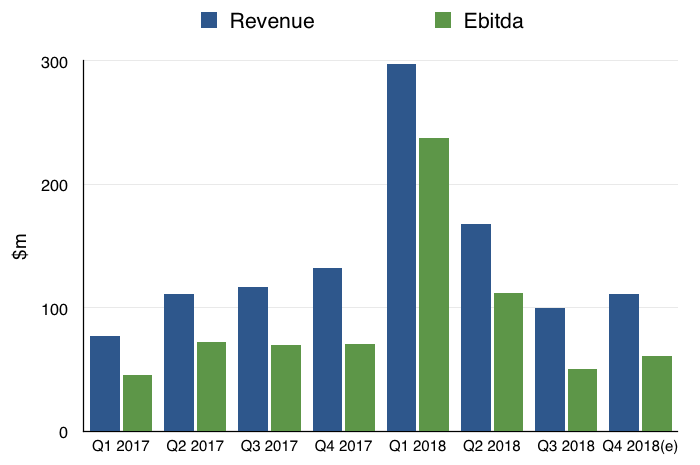 My quarterly chart above suggests the (expected) second-half revenue and Ebitda for 2018 to be $211m and $111m respectively. Yet doubling those figures does not get close to the associated 2019 numbers cited in the SharePad Forecasts tab. 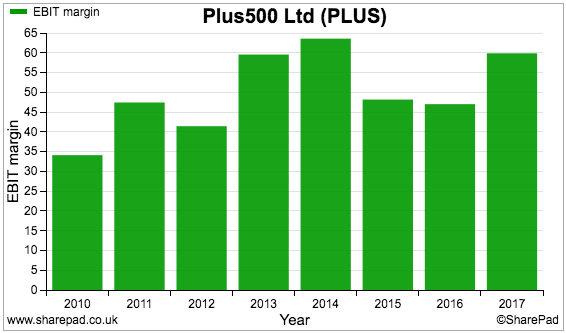 Anyway, the $2.33 earnings per share (EPS) projection for 2019 equates to almost £1.90 and a possible P/E of approximately 7.8. Not as low as the 6.1 multiple for 2018, but still single digit. Going back to my quarterly chart, the (expected) second-half performance of 2018 appears weaker than the second-half performance of 2017. * Enhance the risk warnings within their promotions. Plus500 has also allowed 8% of its customers to become ‘elective professional clients’, who can now avoid the ESMA rules. The group reckons the new regulations will eventually effect ‘only’ 30% of total revenue. Nevertheless, the greater regulation — and the direction of travel within this area — are perhaps other reasons why Plus500 shares trade on such a low multiple. 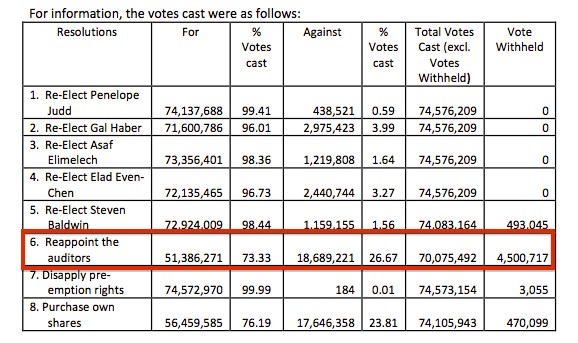 The equivalent proportion at CMC is 44% and the figure at IG is 52%. 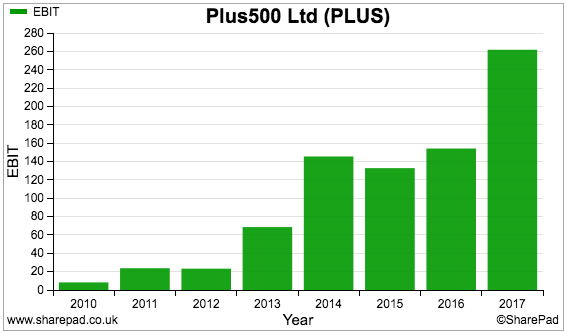 I had presumed Plus500’s focus on small-time traders would have created a greater spread of client income. CMC and IG boast a wider customer-revenue spread than Plus500 — which is odd as these rival operators now prefer to attract fewer, higher-value traders. 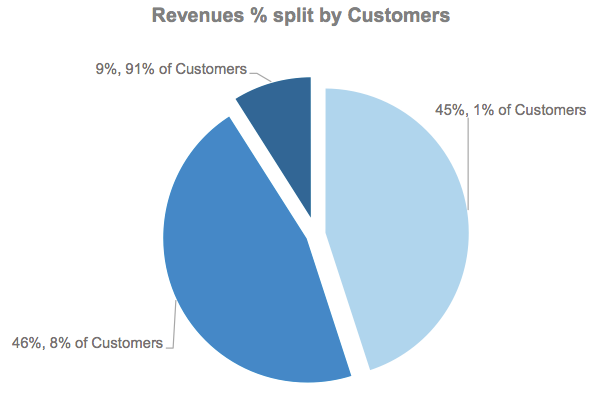 At the last count, 79% of CMC’s income and 80% of IG’s income were derived from 10% of their respective clients. All told, I get the impression Plus500 relies on relatively few customers blasting through many trades before giving up after a year or so. Something similar arguably occurs at CMC and IG, but perhaps not to the same extent. The group’s managing director is a company co-founder and enjoys a 2.6%/£45m stake. His fellow co-founders boast an approximate 5%/£70m holding after selling half of their collective investment last year. The chief executive’s background is interesting. 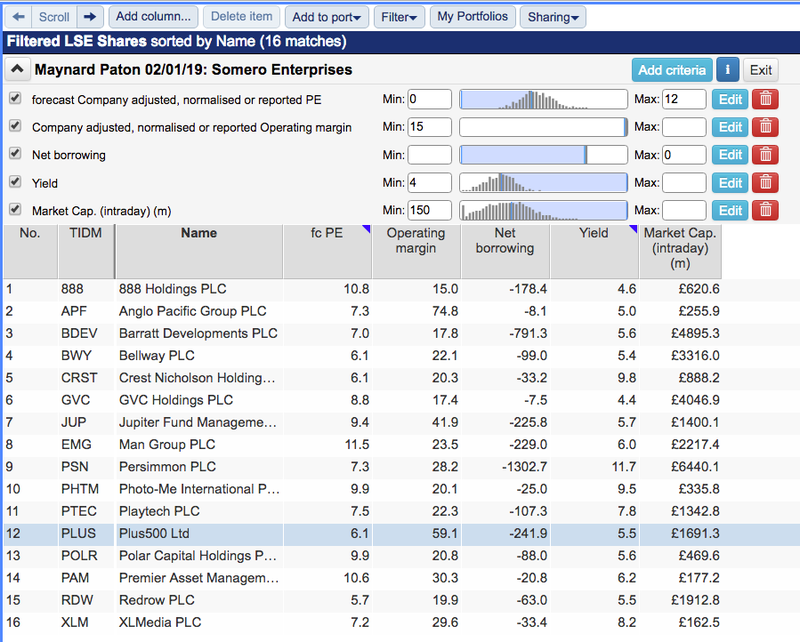 Prior to joining Plus500 during 2012, he was an audit supervisor at PwC Israel. Funnily enough, a member firm of PwC Israel audits Plus500’s accounts — and not everyone is happy with the arrangement. Needless to say, the transfer from AIM to the Main Market has necessitated an upward review of the directors’ remuneration. A “Regulatory Bonus” is a new one on me. True, Plus500’s numbers look great. A forecast P/E of 6.1 gives you tip-top margins, a first-rate ROE, a history of tremendous growth and a thumping great dividend*. 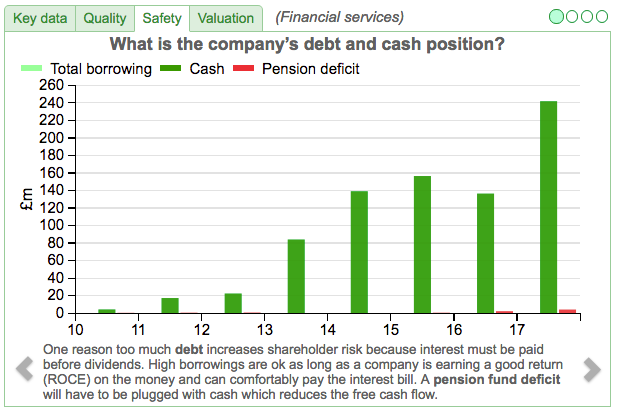 None of the above, though, has stopped the share price more than ten-bagging since the flotation. Famous last words, but I could spot nothing wrong with Plus500’s accounts. Indeed, the aforementioned hefty dividends* underline the fact this business has been an extraordinary cash generator. As such, the investment dilemma simply rests upon whether you feel earnings are truly sustainable for the long term. 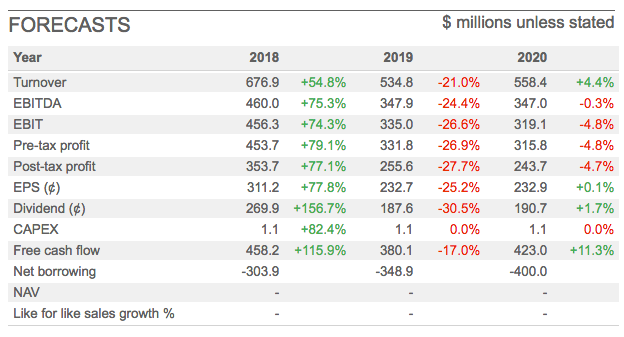 Lower profits are anticipated for 2019, but beyond then…? If profits for 2019 do come in as expected and can be maintained thereafter, Plus500’s single-digit P/E could be a bargain. Will the online adverts keep working? Well, they have up to now. 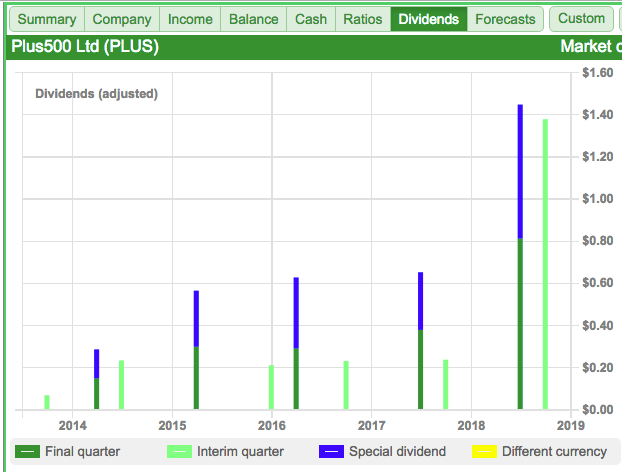 Disclosure: Maynard does not own shares in Plus500.